1.It is indeed a pleasure for me to be here today for the inauguration ceremony of the 35th India International Trade Fair (IITF), which is the flagship event of India Trade Promotion Organisation (ITPO). 2.I am particularly glad to find considerable participation of companies from the SAARC region. Our South Asian neighbours are our highest priority in keeping with our ‘neighbourhood first’ policy. Our approach to South Asia has always been one of seeking shared prosperity and security. The fact, however, is that our region remains amongst the least integrated and developed, underlining the need for greater co-operation and intensification of our trade effort. 3.In this context, it is good to see Afghanistan as the ‘Partner Country’ and Bangladesh as the ‘Focus Country’ in IITF 2015. Through closer economic co-operation with Afghanistan, India can provide not only a vast and growing market for its goods and services, but can also be a source of capital, technology, best-practices and institutions appropriate for Afghanistan’s needs. 4.Bangladesh is one of the faster growing economies in the region. It is emerging as a sound manufacturing base for multinational companies in sectors like textiles. The potential for both our economies to grow together is high, given our resources. Like India, Bangladesh is a nation with a significant population in the productive age group, with 65 percent of her 159 million people falling in the 15 to 64 years age category. Our countries already cooperate in a wide spectrum of economic activities like trade and commerce, and power sector. Our respective economic progress must provide greater opportunities to both our peoples. 5.I take a moment here to mention about Madhya Pradesh, which is the Focus State for IITF 2015. Innovative measures have seen this State making progress on all fronts, particularly agriculture, where the growth rate has been close to 20 percent during the last two years. 6.I also compliment Goa and Jharkhand, the Partner States, for their participation in this prestigious event. Goa is one of the fastest growing states in the country and amongst the leading states in per capita income. Goa’s well-developed social, physical and industrial infrastructure and IT connectivity has led to a strong economic performance, particularly in industrial sectors like mining, tourism and pharmaceuticals. 7.Jharkhand is located in one of the richest mineral zones in the world. It accounts for 40 percent of India’s total mineral reserves. Jharkhand ranks first in coal reserves and second in iron ore reserves. Given its distinct location advantage, the potential for industrial development is high. This State produces 17 percent of the total iron ore produced in the country. 8. The IITF is a brand name in itself and enjoys recognition worldwide. This annual celebration of trade and industry aims to deepen our bilateral relations with the rest of the world. In the realm of external relations, the Government of India has intensified our engagement with neighbours and friendly countries across the globe. Recently in the last week of October, we successfully conducted the 3rd India-Africa Forum Summit. The participation of all 54 African nations in the Summit has, in foreign policy terms, moved us into a select group of nations having the capacity and ability to engage all of Africa simultaneously. India is also working with like-minded countries in multilateral organisations, including the United Nations, to play an enhanced role in diverse fora, from the Arctic Council and the Pacific Alliance to the UN Security Council, where India has made a legitimate claim for permanent membership. The potential of India now has a stronger resonance. 9. IITF 2015 presents an ideal platform for the global fraternity which has a shared interest in trade relations to enhance peace and prosperity. India’s efforts for inclusive economic growth and social advancement have shown the way forward to many developing countries. This is a time of great opportunities in India. Several recent initiatives of the Government of India have already started showing results and have created a positive impact in key sectors. The ‘Make-in-India' initiative to make India an investment and manufacturing destination; the ‘Digital India’ programme to transform India into a digitally-empowered society; ‘Start-up India, Stand-up India’ to promote entrepreneurship and job creation; ‘Smart Cities’; ‘Model Villages’; ‘Swachh Bharat’, and the ‘Clean Ganga Mission’ are some of the flagship schemes of the Government. In the last year alone, almost 140 million bank accounts have been opened under ‘Jan Dhan Yojna’ in a massive effort at financial inclusion. 10. Our economy has admirably withstood the challenging global economic scenario of the past few years. Despite the economic slowdown afflicting major economies of the world, India has remained largely insulated. Barring a below-five percent growth in one year – that is in 2012-13 – our economy has shown resilience. The economic scenario is again looking up with 7.2 percent economic growth in 2014-15. It is expected to improve further as other macro-economic indicators show substantial improvement. Inflation is within control and industrial performance is also showing signs of revival. Fiscal consolidation measures are in place and we should be able to meet the target of 3.0 percent fiscal deficit by 2017-18. 11. The external sector should not be a cause of concern despite a not-so-encouraging export performance last year. Slowdown in global economic activity also finds reflection in decreasing imports, with a substantial reduction in our import dependence on oil, from US Dollar 165 billion in 2013-14 to US Dollar 138 billion. As such, our current account balance has improved with the deficit on this account having reduced from 1.7 percent of GDP in 2013-14 to 1.4 percent in 2014-15. Foreign exchange reserve at 350 billion US Dollars as of end September is at a comfortable level. With a favourable global economic outlook, our diversification strategy focusing on export markets in Asia, Africa and Latin America, and our push for theMake-in-India campaign, I expect to see a turnaround in our export performance soon. The opportunities that are emerging in our economy are there for the taking. Investors, both domestic and foreign, should have the confidence to gain handsome returns from their investments in India. 12. IITF is closely linked to sustained economic growth and trade. We are a 2.1 trillion dollar economy and have the potential to be a 10 trillion dollar economy over the next two decades, provided we are able to provide a fillip to manufacturing and innovation. The centrality of the ‘Make-in-India’ campaign towards the achievement of this goal cannot be over emphasized. I am therefore pleased to note that the theme for this edition of IITF is ‘Make-in-India’. Both ITPO and the Ministry of Commerce have a vital role in making the ‘Make-in-India’ programme a success. It is a matter of satisfaction that the Ministry of Commerce and Industry has taken major reform initiatives on improving the ‘Ease of Doing Business’ in India with added emphasis on simplification and rationalization of the existing rules and enhanced use of IT to make governance more efficient and effective. 13. The IITF endeavours to preserve, protect and promote India’s cultural heritage through collaboration amongst Government, industry, and artisans, craft persons and weavers. This is with a view to establish marketing linkages and promote their products in the business world. I am sure that IITF will take the lead in reinforcing Indian brands. Promising Indian brands can compete and win against dominant international brands in the Indian market before successfully venturing overseas. Successive editions of the trade fair have also proved to be an excellent platform for small and micro enterprises which display their products at different pavilions. 14. The ITPO has taken several initiatives this year to improve facilities offered to visitors. Some of them, including the facility for online registration for business days; introducing a separate award category for the best State pavilion dedicated to ‘Swachh Bharat’ initiatives; and providing details of the fair through mobile applications, are praiseworthy. I compliment ITPO and its supporting agencies for organizing the Fair with improved logistics and facilities. 15. I am confident that this Fair will provide a renewed impetus to trade and commerce and deepen our economic relationship with our trading partners across the globe. I extend my good wishes to all the participants from India and abroad. Best of luck for a successful conduct of the Fair. 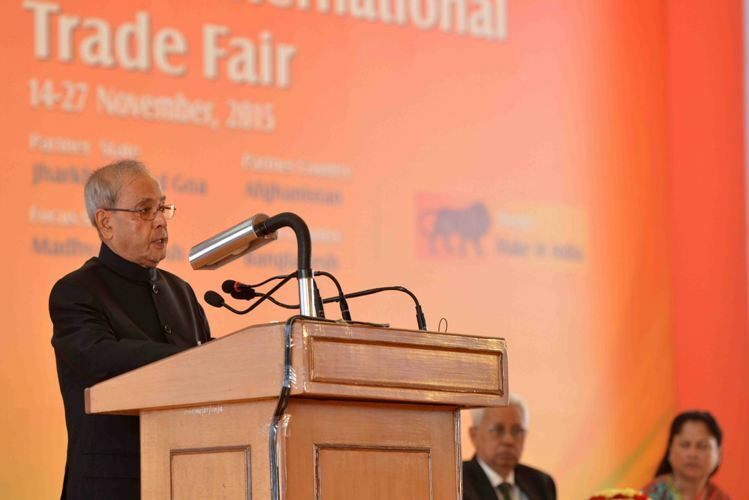 With these words, I declare the 35thedition of the India International Trade Fair open.